Sodoma & Gomorra -  An epic journey of new discovery so fantastic that our natural instinct would be to block it out. 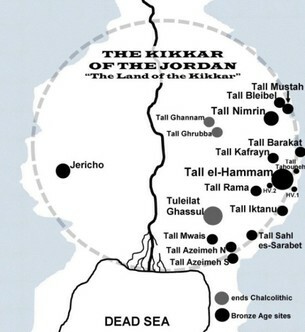 ​A map of the “kikkar” or well-watered plains of the Jordan river. ​“Now having completed the tenth season of excavations, an archaeological team headed by Steven Collins of Trinity Southwest University, New Mexico, has unearthed a goldmine of ancient monumental structures and artifacts that are revealing a massive Bronze Age city-state that dominated the region of Jordan’s southern Jordan Valley, even during a time when many other great cities of the “Holy Land” region were either abandoned or in serious decline. Known as Tall el-Hammam, Collins has been leading excavations at the imposing mound, or tel, since 2005…. Tall el-Hammam seemed to match every Sodom criterion demanded by the text,” he says. 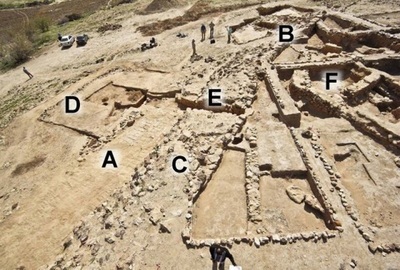 “Theorizing, on the basis of the Sodom texts, that Sodom was the largest of the Kikkar [B&E:”kikkar” means “plain”, precisely how this area is described in the biblical text] cities east of the Jordan, I concluded that if one wanted to find Sodom, then one should look for the largest city on the eastern Kikkar that existed during the Middle Bronze Age, the time of Abraham and Lot. 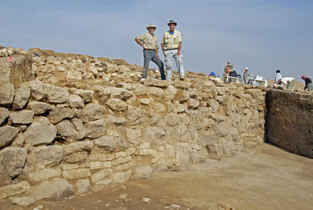 Dr. Steven Collins (left) and a colleague atop the foundation of a Sodom city wall. Collins and his team were able to locate this massive, buried city by using the Bible as their guide. ​And Abram went up out of Egypt, he, and his wife, and all that he had, and Lot with him, into the south. And Abram was very rich in cattle, in silver, and in gold. And he went on his journeys from the south even to Bethel, unto the place where his tent had been at the beginning, between Bethel and Hai; Unto the place of the altar, which he had make there at the first: and there Abram called on the name of the LORD. And Lot also, which went with Abram, had flocks, and herds, and tents. And the land was not able to bear them, that they might dwell together: for their substance was great, so that they could not dwell together. And there was a strife between the herdmen of Abram’s cattle and the herdmen of Lot’s cattle: and the Canaanite and the Perizzite dwelled then in the land. And Abram said unto Lot, Let there be no strife, I pray thee, between me and thee, and between my herdmen and thy herdmen; for we be brethren. Is not the whole land before thee? separate thyself, I pray thee, from me: if thou wilt take the left hand, then I will go to the right; or if thou depart to the right hand, then I will go to the left. And Lot lifted up his eyes, and beheld all the plain of Jordan, that it was well watered every where, before the LORD destroyed Sodom and Gomorrah, even as the garden of the LORD, like the land of Egypt, as thou comest unto Zoar. Then Lot chose him all the plain of Jordan; and Lot journeyed east: and they separated themselves the one from the other. Abram dwelled in the land of Canaan, and Lot dwelled in the cities of the plain, and pitched his tent toward Sodom. But the men of Sodom were wicked and sinners before the LORD exceedingly.- Genesis 13:1-13. ​In their tenth year, the team has dug deep to unearth a great deal of the city. An artist rendering of the ancient city of Sodom based on the recent excavation. 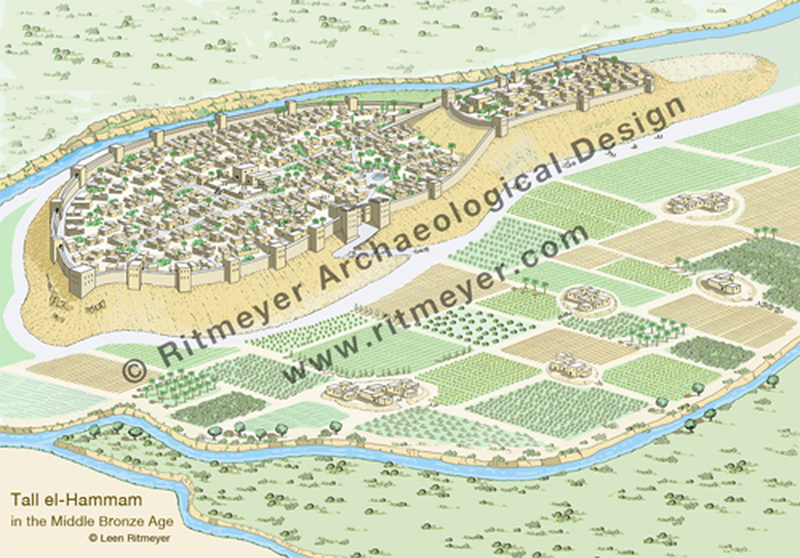 Jordan was a reference to the Jordan river, and specifically the plain on the eastern side of the river. Lot then pitched his tent toward Sodom, facing this thriving city that was in extreme rebellion against God. Soon Lot himself would be drawn to live there, a detail that also held significance in the excavation. 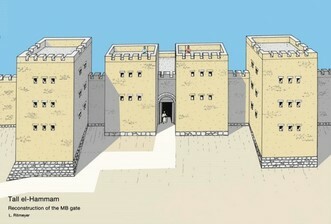 Middle Bronze (MB2) gateway complex: A, Early Bronze (EB3) city wall; B, Early Bronze (EB3) gateway; C, Middle Bronze (MB2) city wall; D, Middle Bronze (MB2) left tower; E, Middle Bronze (MB2) tower entry; F, domestic area. Courtesy Mike Luddeni. “The site is monstrous,” say Collins. He describes the site as consisting of both a lower and upper city. 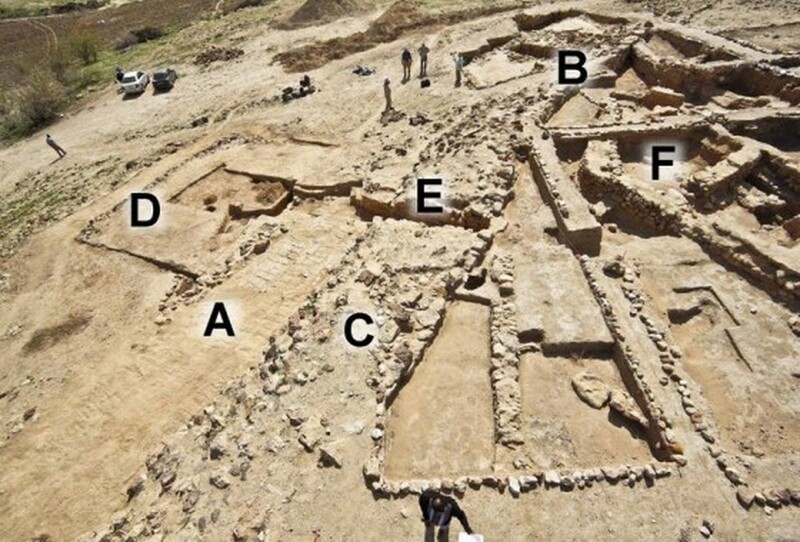 It features Early Bronze Age (3500 – 2350 BCE) evidence for a 5.2 meter thick city wall (built and then re-built stronger following an earthquake) as much as 10 meters in height and made entirely of mudbricks, with associated gates, towers, at least one roadway, and plazas. In Genesis 14, a confederacy of Kings who lived east of Sodom attacked the city, forcing Bera, the king of Sodom, to flee. The Bible records specifically that although a number of cities were attacked during this war: “And they took all the goods of Sodom and Gomorrah, and all their victuals, and went their way. And they took Lot, Abram’s brother’s son, who dwelt in Sodom, and his goods, and departed.” (Genesis 14:11-12). 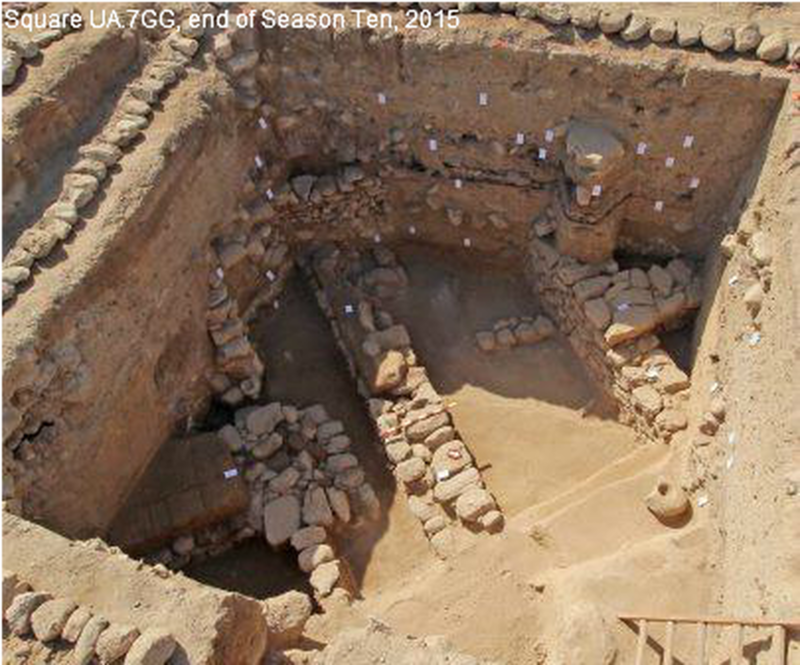 The “goods” of Sodom and its sister city Gomorrah, were of great value. Abram led an assault against the attackers who ransacked Sodom and kidnapped his nephew Lot and was offered the “goods”- most likely, cattle, gold, silver and other portable items, as a reward for rescuing the city. But he refused any payment: “That I will not take from a thread even to a shoelatchet, and that I will not take any thing that is thine, lest thou shouldest say, I have made Abram rich…”(Genesis 14:23). This verse not only demonstrates the humility Abram had before God (as he did not want to give any human benefactor credit for his victory) it reinforces the wealth of Sodom and its royalty. 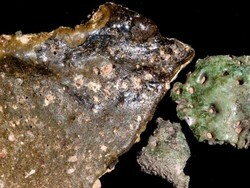 Left: pottery melted from extreme heat found at Tall el-Hammam. Right: “trinitie” stone recovered from ground zero of the New Mexico nuclear blast test in 1945 with similar bubbling and pock marks. One possibility could have something to do with a Middle Bronze period ash layer discovered at various excavation areas of the Tall. The “red palace”, so-called because of the red discoloration of the mudbrick due to a burning, could be another clue. 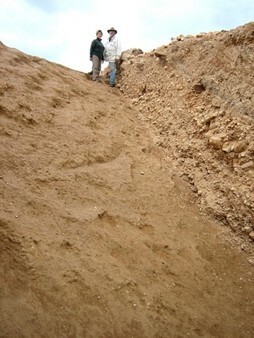 Evidence of fiery destructions are commonplace among archaeological sites across the Levant, usually associated with conflict and military campaigns. Recovered pottery shards evidencing exposure to very high temperature levels, much higher than what would be expected from heating from a kiln or oven, could be yet another clue. Collins has hypothesized that the latter could have resulted from an ancient ‘airburst’, a mid-air explosion caused by an object in the air above the ‘target’ area, such as that of an incoming meteor. ​And there came two angels to Sodom at even; and Lot sat in the gate of Sodom: and Lot seeing them rose up to meet them; and he bowed himself with his face toward the ground; And he said, Behold now, my lords, turn in, I pray you, into your servant’s house, and tarry all night, and wash your feet, and ye shall rise up early, and go on your ways. And they said, Nay; but we will abide in the street all night. 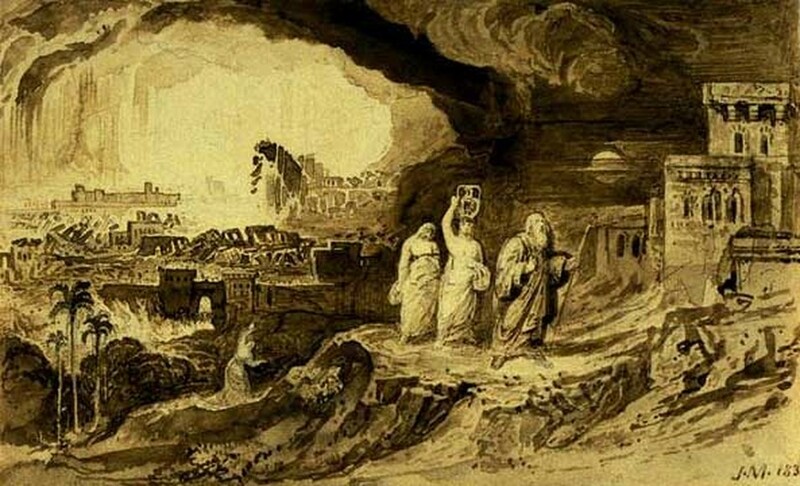 An artist rendering of the gate of Sodom, based on the excavation by Collins and his team. 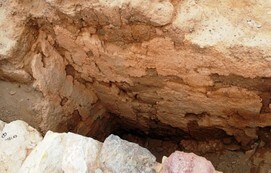 As with the recent translation of an ancient Hebrew scroll that contained Biblical passages matching the text of today’s King James Bible, or the recent discovery of the “Last Supper Necklace” – a 3,500 year old Egyptian necklace that contained a series of Bible verses on it, the excavation of Sodom provides even further ancient confirmation of the truth and accuracy of the Bible. In the New Testament, Scripture explains that Sodom and Gomorrah stood as a type and symbol for the eternal damnation of Hell. A wealthy, prosperous city that seemingly “had it all” found it that there is nothing good in life when one is in rebellion against God. All the worldly possessions, fame and pleasures in the world can be taken from us in an instant. That is how precious and fragile life is. And the lesson we are to learn from Sodom is that we are trust, believe and worship God, lest we face the fire and brimstone of eternal damnation. Each day we are alive we are given the opportunity to believe God and avoid his wrath like Abraham and Lot or reject God, doubt His word and carry on with our sinful ways like the city of Sodom. Psalm 86:5 says of God: “For thou, Lord, art good, and ready to forgive; and plenteous in mercy unto all them that call upon thee.” God’s desire is for sinners to pray to Him for forgiveness, which He gives freely. Jesus Christ earned the right to redeem those who believe by giving His life on the cross and taking the wrath all people deserve. ​All people, this author included, like the people of Sodom, have sinned willfully and repeatedly against God. The only question is will remain in that sin, stubbornly rejecting God or humble ourselves like Lot and flee the sinful life before destruction comes. God wants us to repent and believe. And even the ancient world cries out to believe ( via beginningandend.com ). Ciudad Perdida: Lost City in Colombian Highlands holds Mysteries of Ancient Civilization. A CROWN FIT FOR A GIANT? Italian Father Carlo Crespi tries on a Giant kings crown he found in the cave named "Cueva de los Tayos" Ecuador. AMAZING - Electrical Device Found At Gunung Padang.